For all Nissan/Datsun 4- and 6-cylinder L-series engines. Parts identification and interchange. Concise text leads you through each engine rebuilding step. Gives comprehensive information on how to diagnose, remove, tear down, inspect, recondition, assemble and install. Includes all steps necessary to do a professional, quality rebuild. Bonus sections include parts identification and interchange as well as in-vehicle cylinder head and timing chain repair. More than 500 photos, drawings and charts. 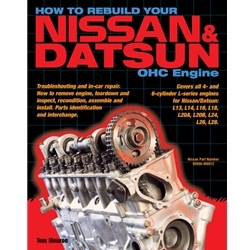 Learn how to breathe new life into your Nissan/Datsun L-series engine. Do it right with this book.